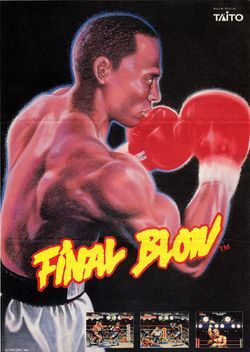 Final Blow is a boxing arcade game, that was released by Taito Corporation in 1988, and licensed to Romstar for US manufacture and distribution; it was the first game to run on that company's then-new F2 hardware (a Motorola 68000 running at 12 MHz with a Zilog Z80 running at 4 MHz, and a Yamaha YM-2610 running at 8 MHz for sound). The players must take controls for two of five different boxers, nicknamed: Dynamite Joe ("Miracle Man"), Fernando Gomez ("South American Eagle"), Kim Nang ("Korean Comet"), King Jason ("Black King"), and Detroit Kid ("Invincible Black Panther" - not to be confused with Konami's 1987 platform game Black Panther). For a one-player game, after the player has selected a boxer he must fight the other four in the same number of matches in order to become the champion; however, for a two-player game, both players must fight each other in a single match. The game was later ported to the Sega Genesis in 1990 under the name James "Buster" Douglas Knockout Boxing - and it added the real (and then-current) heavyweight champion James "Buster" Douglas, along with a new masked boxer named Iron Head, to the cast, for a total of seven boxers. This page was last edited on 7 October 2014, at 16:00.